Doxazosin, a quinazoline-derivative, selectively antagonizes postsynaptic α1-adrenergic receptors, used in the treatment of high blood pressure and urinary retention associated with benign prostatic hyperplasia. Labetalone hydrochloride is hydrochloride form of labetalone, a blocker of both alpha- and beta-adrenergic receptors that is used as an antihypertensive. Bisoprolol fumarate is a selective type β1 adrenergic receptor blocker. Ivabradine HCl, a new If inhibitor with IC 50 of 2.9 μM which acts specifically on the pacemaker activity of the sinoatrial node, is a pure heart rate lowering agent. Cisatracurium Besylate is a nondepolarizing neuromuscular blocking agent, antagonizing the action of acetylcholine by inhibiting neuromuscular transmission. Doxazosin is a quinazoline-derivative that selectively antagonizes postsynaptic α1-adrenergic receptors. Celiprolol is a β1-adrenoceptor antagonist with partial β2 agonist activity. Esmolol is a cardioselective beta1 receptor blocker with rapid onset, a very short duration of action, and no significant intrinsic sympathomimetic or membrane stabilising activity at therapeutic dosages. Prazosin is an α1-blocker that acts as an inverse agonist at alpha-1 adrenergic receptors. It is used to treat hypertension. Alfuzosin, a quinazoline derivative, is a selective and competitive α1-adrenoceptor antagonist. Alprenolol hydrochloride is the hydrochloride salt form of alprenolol, which is an beta adrenergic receptorantagonist and is used as an antihypertensive, anti-anginal, and anti-arrhythmic agent. Bevantolol hydrochloride is a cardioselective, beta adrenoceptor antagonist, devoid of intrinsic β sympathomimetic activity and with weak membrane-stabilizing and local anesthetic properties. Silodosin is a highly selective α1A-adrenoceptor antagonist, used in treatment of benign prostatic hyperplasia. Nebivolol HCl selectively inhibits β1-adrenoceptor with IC50 of 0.8 nM. BMY 7378 is a multi-targeted inhibitor of α2C-adrenoceptor and α1D-adrenoceptor with pKi of 6.54 and 8.2, respectively, and acts as a mixed agonist and antagonist for 5-HT1A receptor with pKi of 8.3. Prazosin HCl is a competitive alpha-1 adrenoceptor antagonist, used to treat high blood pressure or benign prostatic hyperplasia. Metoprolol Tartrate is a selective β1 receptor blocker medication, used to treat hypertension and heart failure. Terazosin HCl is a selective α1-adrenoceptor antagonist, used for treatment of symptoms of an enlarged prostate (BPH). Naftopidil DiHCl is a selective 5-HT1A and α1-adrenergic receptor antagonist with IC50 of 0.1 μM and 0.2 μM, respectively. Maprotiline HCl is a selective noradrenalin re-uptake inhibitor, used in the treatment of depression. Carvedilol is a non-selective beta blocker/alpha-1 blocker, used to treat congestive heart failure (CHF) and high blood pressure. Naftopidil is a selective α1-adrenergic receptor antagonist with Ki of 3.7 nM, 20 nM, and 1.2 nM for α1a, α1b, and α1d, respectively, used for the treatment of benign prostatic hyperplasia. Phenoxybenzamine HCl is a non-specific, irreversible alpha antagonist with an IC50 of 550 nM. Sotalol is a non-selective beta blocker and a potassium channel blocker with an IC50 of 43 μM. Timolol Maleate is a non-selective, beta-adrenergic receptor antagonist for β1/β2 with Ki of 1.97 nM/2.0 nM. Acebutolol is a β-adrenergic receptors antagonist used in the treatment of hypertension, angina pectoris and cardiac arrhythmias. Betaxolol is a β1 adrenergic receptor blocker with IC50 of 6 μM. Buflomedil HCl is a vasodilator used to treat claudication or the symptoms of peripheral arterial disease; A nonselective alpha adrenergic receptor inhibitor. Tolazoline is a non-selective competitive α-adrenergic receptor antagonist. Atipamezole is a synthetic α2 adrenergic receptor antagonist. It has also been researched in humans as a potential anti-Parkinsonian drug. Atipamezole hydrochloride is hydrochloride form of atipamezole. Atipamezole is a synthetic α2 adrenergic receptor antagonist. It has also been researched in humans as a potential anti-Parkinsonian drug. Terazosin is a selective alpha-1 antagonist used for treatment of symptoms of an enlarged prostate (BPH). It works by blocking the action of adrenaline on smooth muscle of the bladder and the blood vessel walls. Levobetaxolol exhibits a higher affinity at cloned human β1 and β2 receptors with Ki value of 0.76 nM and 32.6 nM, respectively. ICI-118551 is a highly selective β2-adrenergic receptor antagonist with Ki values of 0.7, 49.5 and 611 nM for β2, β1 and β3 receptors, respectively. Esmolol is a cardioselective b-blocker, used to control rapid heartbeats or abnormal heart rhythms. Betaxolol is a selective beta1 adrenergic receptor blocker used in the treatment of hypertension and glaucoma. Carteolol HCl is a β-adrenoceptor antagonist, used for the treatment of glaucoma. Atenolol is a selective β1 receptor antagonist with log Kd values of −6.66±0.05, −5.99±0.14, −4.11±0.07 for binding to the human β1-, β2- and β3-adrenoceptors. Labetalol HCl is a dual antagonist for both selective alpha1-adrenergic and nonselective beta-adrenergic receptors, used in the treatment of high blood pressure. Salbutamol Sulfate is a short-acting β2-adrenergic receptor agonist with an IC50 of 8.93 µM. Olodaterol hydrochloride is the hydrochloride salt form of Olodaterol, which is a long-acting beta2-adrenergic agonist. Isoxsuprine hydrochloride is a beta-adrenergic agonist with vasodilator activity. Fenoterol hydrobromide is the the hydrobromide salt of fenoterol, a β2 adrenoreceptor agonist with bronchodilator activity. Fenoterol is a β2 adrenoreceptor agonist with bronchodilator activity. (−)-Norepinephrine is a natural neurotransmitter and hormone. 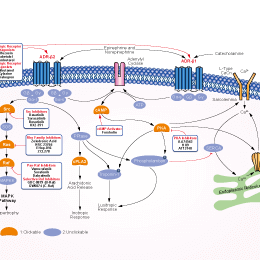 It is an agonist of adrenergic receptors with Ki values of 330, 56, and 740 nM for α1, α2, and β1 adrenoceptors, respectively. Tizanidine is an imidazoline derivative and a centrally acting α2 adrenergic agonist used as a muscle relaxant for therapy of acute muscle spasms and chronic spasticity. Epinephrine bitartrate is an alpha- and beta-adrenergic receptor stimulator. Dexmedetomidine is a sedative medication used by intensive care units and anesthetists. L-Adrenaline belongs to a group of the compounds known as catecholamines. Phenylephrine HCl is a selective α1-adrenergic receptor agonist, used primarily as a decongestant. Guanabenz Acetate is an selective agonist of α2a-adrenergic receptor, α2b-adrenergic receptor and α2c-adrenergic receptor with pEC50 of 8.25, 7.01 and ~5, respectively. Naphazoline HCl is an ocular vasoconstrictor and imidazoline derivative sympathomimetic amine. Ritodrine HCl is a hydrochloride salt of ritodrine which is a β-2 adrenergic receptor agonist. SynephrineHCl (Oxedrine, p-Synephrine) is a sympathomimetic α-adrenergic receptor (AR) agonist. Medetomidine is a selective α2-adrenoceptor agonist, with Ki of 1.08 nM, exhibts 1620-fold selectivity over α1-adrenoceptor. Tizanidine HCl is an α2-adrenergic receptor agonist and inhibits neurotransmitter release from CNS noradrenergic neurons. Detomidine HCl produce dose-dependent sedative and analgesic effects, mediatated by activation of α2 catecholamine receptors. Scopine is the metabolite of anisodine, which is a α1-adrenergic receptor agonist and used in the treatment of acute circulatory shock. Salmeterol Xinafoate is a long-acting β2-adrenergic receptor agonist with anti-inflammatory effects, used in the treatment of asthma symptoms and chronic obstructive pulmonary disease (COPD) symptoms. DL-Adrenaline is a hormone and a neurotransmitter secreted by the medulla of the adrenal glands. Brimonidine Tartrate is a highly selective α-adrenergic receptor agonist with EC50 of 0.45 nM for the α2A adrenoreceptor, and used to treat open-angle glaucoma or ocular hypertension. Noradrenaline bitartrate monohydrate is a direct alpha-adrenergic receptors stimulator. Terbutaline Sulfate is a selective β2-adrenergic receptor agonist with IC50 of 53 nM. Clorprenaline HCl is a β2-receptor agonist, it has a significant expansion of the bronchial effect. Tetrahydrozoline HCl is an imidazoline derivative with alpha receptor agonist activity. Amitraz is a triazapentadiene, an α2 adrenergic agonist and a member of the amidine chemical family. It is a non-systemic acaricide and insecticide. Guanfacine Hydrochloride is a selective α2A-adrenoceptor agonist with anti-hypertensive effect. Bambuterol HCl is a potent β-adrenoceptor agonist, used in the treatment of asthma. Synephrine, a natural protoalkaloid in the extract of bitter orange and other citrus species, is commonly used for weight loss. Adrenalone is an adrenergic agonist used as a topical vasoconstrictor and hemostatic, mainly acts on alpha-1 adrenergic receptors. Deoxycorticosterone acetate is a steroid hormone used for intramuscular injection for replacement therapy of the adrenocortical steroid.